September 15, 2008 by peppersprouts in "contest", "plush toy"
This little dapper cat is hand sewn from recycled and felted wool. The ears and belly are made from a lovely blue patterned cotton. He is stuffed with pure wool. 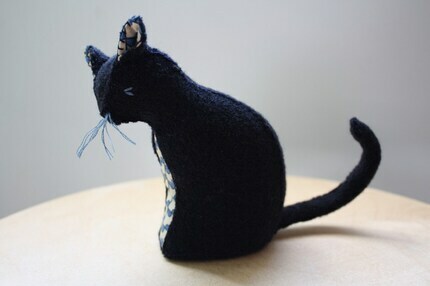 The tail has a wire to help give it a little curl (or however you may like it). He's so stylish, even his cute blue whiskers match! This little cat measures measures about 5 inches tall and 3 inches wide. And has been featured recently on the etsy front page! Cary who is the artist behind littleloveblue is self taught artist, and full time mother, living in Brooklyn, NY. She grew up in a family full of artists and crafters but some how never learned how to sew. In college and graduate school she majored in Women's Studies and Film and was very interested in the history of women's artistic and creative endeavors, but it wasn’t until she was an adult and had her own children that she sought out a means to express her own creativity. She has become very interested in the history of traditional crafting, and choose to sew almost entirely by hand using only natural materials. Through her work, she strives to find beauty in simplicity, in the things we often over look in our busy lives. 1. To enter to win, tell the world why you want this furry cat. Post about your love of this bag and littleloveblue on Myspace, Facebook, livejournal, wordpress, blogger, or your own personal blog or website. 2. Post a link to your personal post right here in the comments section. 3. Entries can be submitted through 10pm Saturday, September 20th, 2008. The winner of the totebag from KimmChi goes to cakehouse!